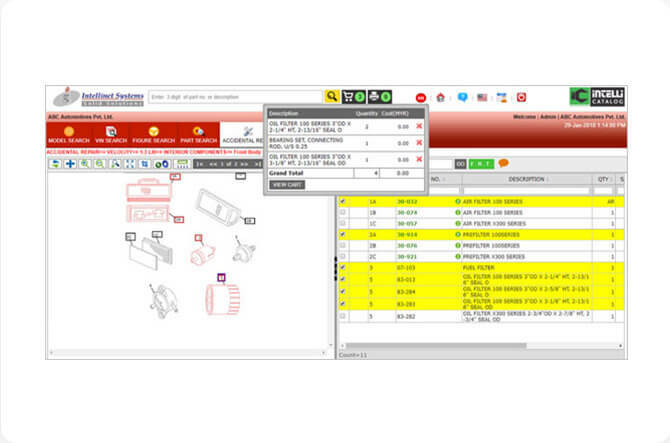 Intelli Catalogue is a digitalized spare parts catalog which meets all the requirements of dealers related to spares. The electronic spare parts catalogue software contains all the information regarding spare parts and the accessories in a well-formulated manner. The illustrated Spare Parts Catalogue software which is fully supported with assembly drawings (2D), advance graphics and more technical features. 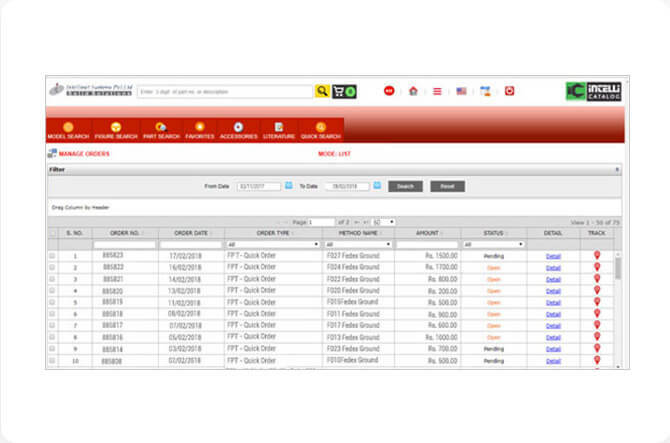 Intellinet electronic part catalogue software also have advanced part search feature to quickly identify accurate spare part and the selected parts can be directly added to cart for ordering. Intelli Catalogue – Electronic spare parts catalogue has various unique features embedded especially for dealers. These features will help dealers to accomplish various time-consuming and complex tasks with just few mouse clicks. In addition, it is also capable in minimizing errors and boosts up their aftermarket sales. Let’s have a look at the unique features of electronic spare parts catalogue software. Every dealer deals with thousands of spare parts on day to day basis. Thus, identifying the accurate spare part is one of the major challenges for them. 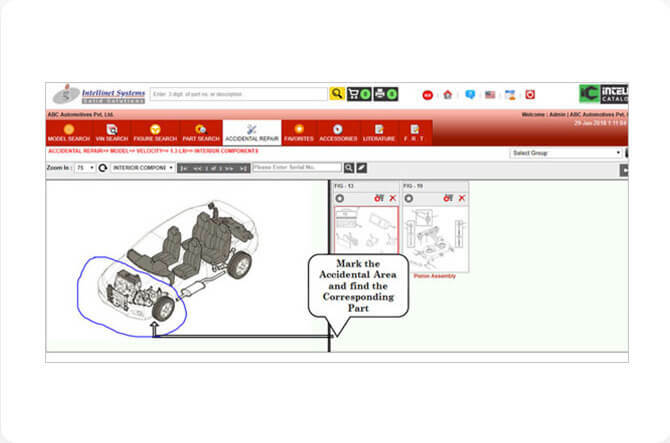 With our web-based spare parts catalog software, dealers can easily find the accurate part with 2D assembly drawings, graphics etc. 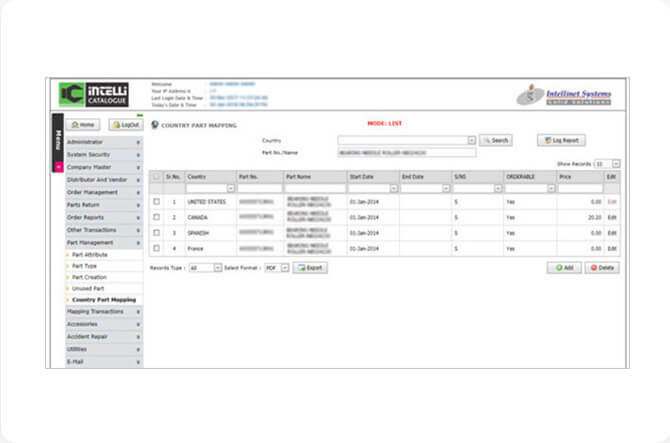 the EPC Management Solution allows you to navigate the catalog via assembly groups, parts etc. Many times in case of accidents etc. dealers are not known to all the parts required for rebuilding the vehicle. In such a situation, our unique accidental repair feature helps them to find entire assembly set with just few mouse clicks. Dealers just need to select the model number, encircle the damaged area and all the parts will be shown with part number and other relevant information will be shown. With web-based online parts catalogue software, dealers are not required to create prepare an order manually via excel sheet etc. On the contrary, they just need to select the required spare parts, create an order list that can be easily imported into excel, send via mail or used directly for placing the order. 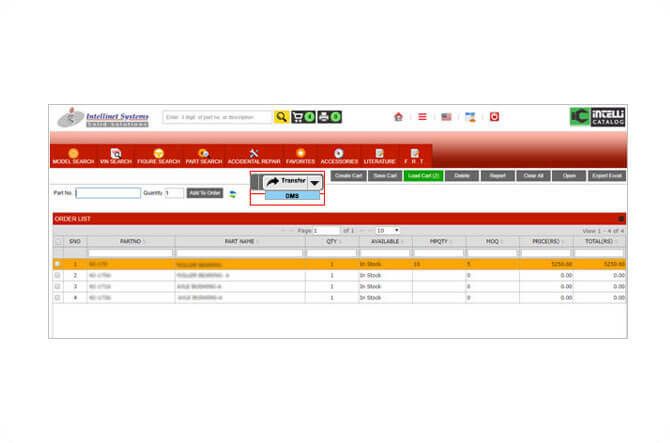 With web-based parts catalog, dealers are not required to create an order manually via excel sheet etc. On the contrary, they just have to select the required spare parts, creating an order sheet which can be easily imported into excel, send via mail or used directly for placing the order. Dealers always mark the price of spare parts after adding some profit margin and online catalogue software allows dealers to list price after adding a certain profit percentage. This price listing is completely flexible, dealers can easily increase and decrease their profit margin as and when they want. Sometimes Wrong billing address makes the delivery process complex as well as leads to wastage of time and effort. Thus, our electronic part catalogue is enabled with address authentication feature which ensures that the address provided by the user is valid . Integration with ERP, DMS, SAP etc. 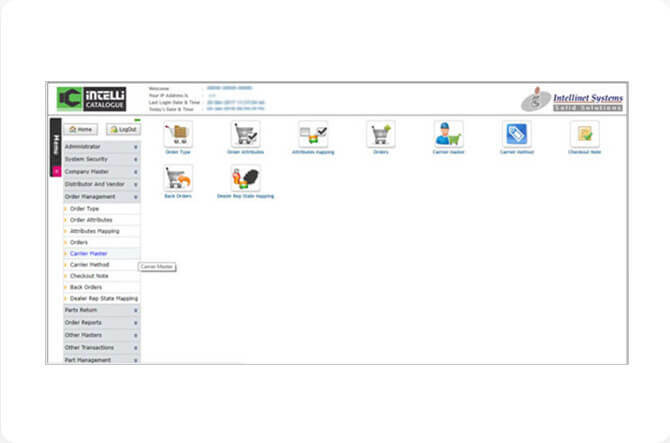 Electronic spare parts catalogue can also be integrated with ERP, DMS, SAP etc. for the easy ordering process. It automates the ordering process and makes it similar to an e-commerce website. The online spare parts catalogue is available in different formats which increases its utility manifolds. Dealers can use the format suiting their sources and utility. The EPC software is available for web, desktop, mobile phones, Android, IOS, CD/DVD etc. Wrong orders are quite common in case of the manual process which increases the customer support expenditure. 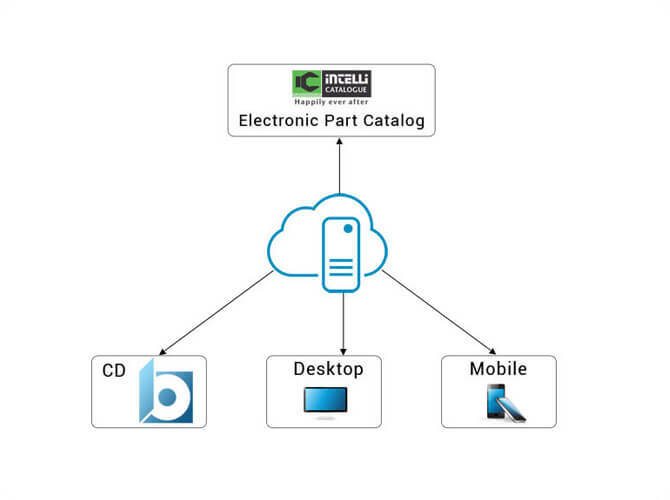 Electronic parts catalogue software automates the part identification process which leads to accurate orders minimizing customer support expenditure. With the modification in the design of the spare part, OEMs have to provide the information about the change and other relevant information. 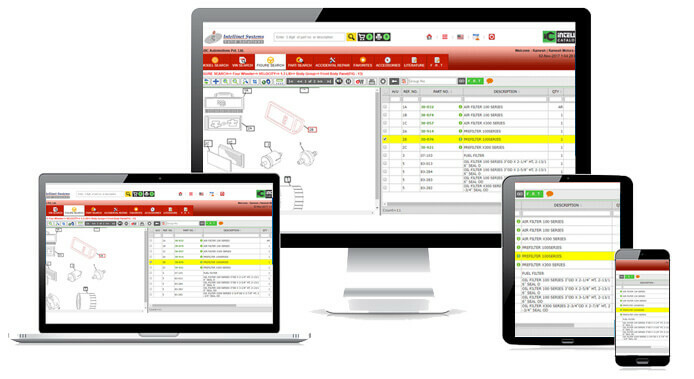 With Electronic spare parts catalogue software, ECI & ECN information is circulated instantly as well as assessable in just few clicks . Happy customers are the backbone of any business and excellent customer services are one of the best ways to make your customers happy. With EPC Management Solution, wrong orders are minimized, up-to-date information serves a long way in providing efficient customer services and making customers happy. 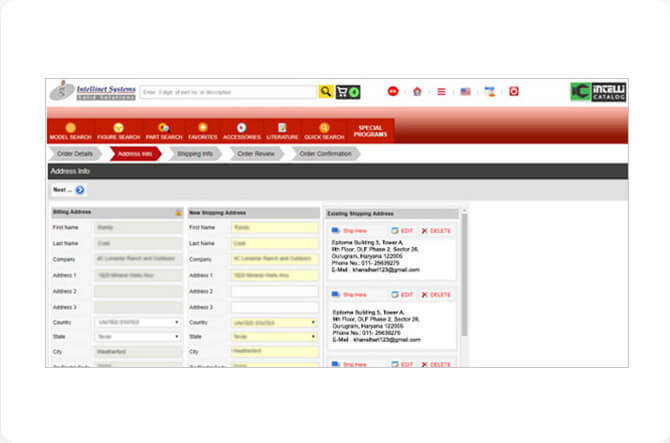 Web-based parts catalog also provides the storefront for direct spare parts sales which creates a new profit center for the dealers. It is just like an e-commerce store which provides easy parts search option as well as check-out option to the users making spare parts purchases a child’s play. Intelli Catalogue is a one-stop solution for Dealers for managing, identifying, ordering, selling spare parts. In addition, it also makes various complex and time-consuming process easy. Thanks for being here. Please fill the details below for instant free demo. Sector - 48, Gurgaon, Haryana - 122018, India. Copyright © 2018-19 intellinetsystem.com. All rights reserved.